Looking for an AC repair expert in Scottdale? For all of your Scottdale air conditioning maintenance needs, you can rely on R Fulton Improvements for quality AC repairs and friendly customer service. 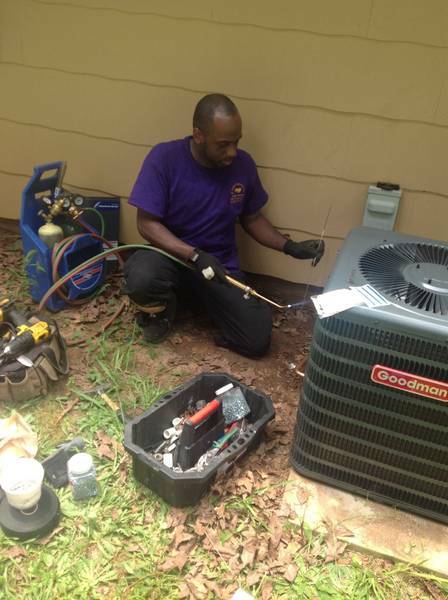 We've been repairing air conditioning systems in Scottdale, Georgia for more than 8 years. Our staff is well qualified and Georgia certified to perform repairs, installation, and service on all makes and models of air conditioning systems. We specialize in central air systems, split systems, and portable window units. Call (678) 251-9181 for prompt Scottdale AC repair service. R Fulton Improvements can help you keep your cool all year long by making sure your Scottdale AC system is in tip top shape. Our Scottdale central air conditioning system tune-ups include thorough examination of all system components, including coils and conductors. An AC unit with dirty coils uses more electricity and cools less effectively, making the compressor work harder than it has to. Burned conductors can damage the AC compressor and may significantly reduce your system's efficiency. Call R Fulton Improvements today at (678) 251-9181 for AC repair service in Scottdale, Georgia.